The top 20 brands on Facebook boasted an average of 14,481,490 likes at the end of February and averaged 44 posts for the month, according to the most recent statistics from social media analytics platform Socialbakers. The top industry in terms of Facebook likes for February was retail food, at 175,123,649. 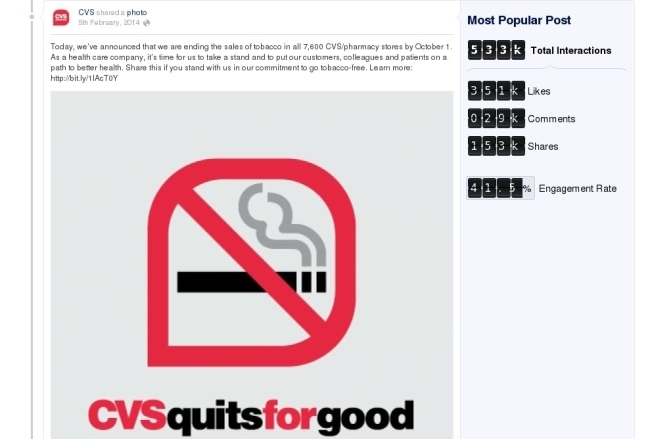 Walmart remained the top brand on the social network in terms of likes, with 32,134,392. Disney also held on to the title of top media brand, with 11,937,076 likes. The top brand in terms of Facebook post engagement rate was Evolution Fresh, at 7.05 percent. Socialbakers’ Socially Devoted list for February was once again topped by T-Mobile USA, with a score of 899.